Study tips!! Do not wait to the last minute to study!! Ever take a test and felt like you didn’t study? Waiting to the last minute is definitely not the best choice. 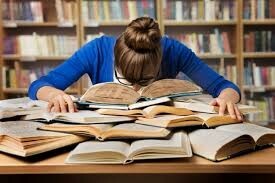 Studying a lot of information at one time can be consuming. I don’t know how many times I’ve tried to study the day before and failed the test the next day. Over time I found that this strategy was not successful. The strategy worked a couple times but for the most part it was not successful. It wasn’t until I began to try other study methods that my grades improved drastically. Another way to study is to use flashcards. I know that making and studying flashcards takes time, but it is effective. With flash cards you can increase your memory due to repetitive exposure of terms and ideas. In fact, if you study with flashcards a little every day you will eventually learn all of the content needed for taking a test. This method has saved me many times. Studying with flashcards to me is most effective when doing them with a partner. When doing them with a partner you can allow yourself to truly think. With a partner it allows you not to cheat while trying to figure out the subject that displays on an index card that has the term on it. Forming a group is another helpful way of studying. This method could be helpful because everybody in the group would have a chance to share their ideas and information with each other. This way whatever knowledge that was not known prior to group study will be known after. In my opinion group is fun. I was not by myself feeling lost. I believe that a group- like atmosphere can be beneficial to everybody. I remember a time I was in 12th grade and I had no idea about anything we were learning. By the time I got out of the group I had much more infinite knowledge about the subject and I ended up passing. Highlighting is a very good tool to use when studying. Using the highlighter allowed me to pick out the core parts of the notes that are most important. I used to never understand my notes. Every time I found myself going back to the text or notes to review, the highlighted marks helped me understand the material. One big thing is putting your phone away while studying. Trust me, your phone is your worst enemy. I used to study for like five minutes and I would end up on my phone for the next 30 minutes. Then I would try to study but all that I studied had gone out the window. Phones can often offer distractions that can take your focus away from studying. TAKE IT PORTION BY PORTION! Over-studying can be bad. It is better to study a couple hours at a time. The reason being that after two hours it is said that whatever you study is no longer retainable. And plus, it can give you a headache and mess up your whole mood about studying. I used to always quit after studying for like two hours and not getting it. These are some of the tips over time I felt helped me. We all have big exams that might feel overwhelming. By studying with the right strategy, learning and studying for a test can become a lot easier. You cannot study without a plan. With these tips I hope that you guys will use some of these strategies to help you guys out in your study process. Easier studying and easier test taking is all you can ask for.